Elesta have just added this miniature 3 channel optical encoder, cased in 7 x 13mm aluminium housing, to its wide product portfolio. It is one of the smallest on the market and it is fitted with 2 precision ball bearings, guaranteeing exceptionally smooth running and a long service life at speeds of up to 80,000 rpm! Even at these high speeds, a very exact signal quality and accuracy is achieved. The encoder is designed to operate with 4 mA current at 5V, making it ideal for battery-powered applications. The E OI R007 housing is mounted using grub screws, securely braced against rotation. 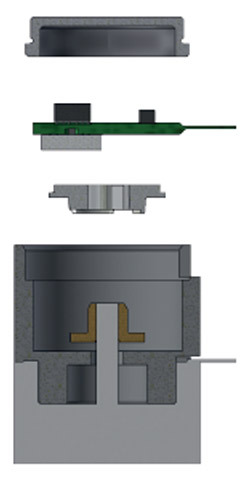 Coupling of the encoder with commercial clutch elements for connection to motors, gearboxes or the like, are just as straightforward as the adaptation of potentiometer knobs with clamps or a fixing screw. 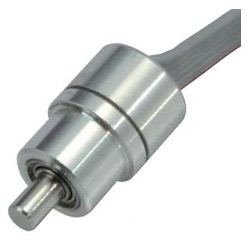 The chamfered output shaft has a diameter of 2 mm and is flattened on two sides. Dental drills and general robotics are a typical applications. The optical encoder is also available as a modular system in kit form, giving customers the option to integrate the sensor and code wheel kit in an existing housing, motor or system. Inside the miniature housing is the patented unique Elesta encoder system - the E OI R, an integrated system operating on the basis of a new optical focussing incidental light method. Within the integrated system are multiple reflective parabolic shaped concave mirrors, forming the code segments of the code wheel. The clever design of the mirrors reflect only an extremely clear and steep concentration of light from the transmitter LED, ensuring exact signal quality and accuracy across the entire speed range. 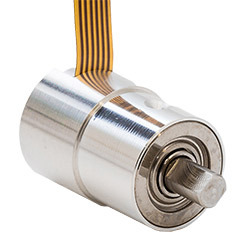 The encoder delivers 128 pulses at any rotation speed, to two outputs that are phase shifted by 90°. The third channel provides one index pulse per revolution. This new Optical Encoder system meets the growing demand for miniaturisation of micro mechanical drives. Additionally the system offers higher precision in controlling motor speed and position. The light source and photo detector are mounted in the same plane facing the code wheel. The unique design of the code wheel is such that the complete surface of the wheel is reflective. This ensures that nearly all incoming light from the light source, is reflected on the light sensor. This patented feature has resulted in an encoder of compact design, with extremely low power consumption, high resolution and precise output signals. The flexibility of this encoder system allows it to be integrated into a variety of housings of systems and motors with ease. 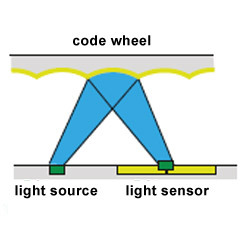 The uniquely shaped reflective surface of the encoder wheel reflects and focuses light emitted by the light source on the light sensor. More than 90% of light emitted by the light source arrives at the light sensor for signal generation. This allows the implementation of low level light sources, which in turn drastically reduces the power consumption of the entire system. The encoder system is well suited for off-grid systems and mobile devices. Tolerances between code wheel and sensors have little or no influence on the accuracy of the sensor output signals. This is an advantage over most other comparable systems and improved the reliability of the system as a whole. Extreme environmental conditions have minimal affects on the signal quality. Coupled with the feature of individual design options, easy integration with customer specific products and the miniaturised footprint, this encoder is ideally suited for high reliability applications. The precision of the code wheel, the focusing of the light beam and the use of a CMOS control circuit achieve a high slew rate and very tight signal tolerances. The specification is based on a code wheel with 128 reflectors and achieves an angular tolerance of less than ± 0.14°. This proves that the design of miniaturised precise angle sensors is both possible and efficient. The accuracy of outputs are highly immune to the positional tolerance between code wheel and sensor. We can provide an encoder as a modular system in kit form. 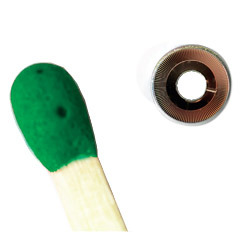 Customers have the option to integrate the sensor and code wheel kit in an existing housing, motor or system. Alternatively customers may integrate the encoder system as a universal encoder in a preferred housing. Accessories allow customers the capability to adapt the universal encoder to their system. The unique design of the code wheel enables the Elesta system to achieve higher signal selectivity than comparable reflective systems. This lies in the fact that the light efficiency of the design is a factor two better than most of the comparable systems. The high precision of the output signals allows the system to retain its accuracy after 2-fold and 4-fold interpolation. We have the capability to develop customer specific solutions and to adapt the encoder design to meet customer application requirements.